I went to "cafe ambiente" in Daikanyama. 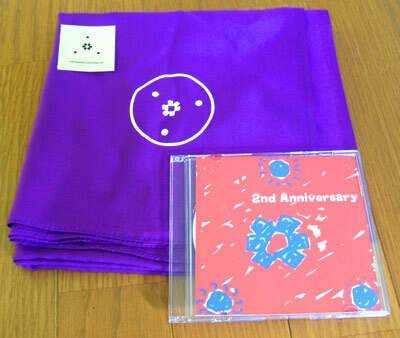 "cafe ambiente" has two years anniversary and the picture below is the memorial items. They choose the "Furoshiki" which is a type of traditional Japanese wrapping cloth that were frequently used to transport clothes, gifts, or other goods. I think that this is very good idea to keep our own traditional culture. Furoshiki (風呂敷, furoshiki) are a type of traditional Japanese wrapping cloth that were frequently used to transport clothes, gifts, or other goods. Although possibly dating back as far as the Nara period, the name, meaning "bath spread", derives from the Edo period practice of using them to bundle clothes while at the sentō (public baths). Before becoming associated with public baths, furoshiki was known as hiradzutsumi (平包), or flat folded bundle. Eventually, the furoshiki's usage extended to serve as a means for merchants to transport their wares or to protect and decorate a gift. Modern furoshiki can be made of a variety of cloths, including silk, cotton, rayon, and nylon. Furoshiki are often decorated with traditional designs or by shibori, chirimen. There is no one set size for furoshiki, they can range from hand sized to larger than bed-sheets. The most common sizes are 45cm (17.7 inch) and 68-72cm (26.7-28.3 inch). 風呂敷の使い方/ how to use "Furoshiki"